German Game: Please click on the Board Game Geek link below for a good English translation! 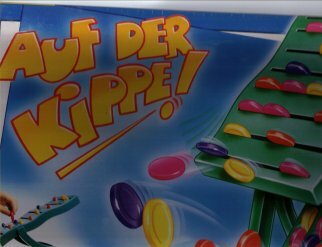 Auf der Kippe means something like "at the tipping point" and is actually a very suitable name for this dexterity game. The basic concept is a bit like Jenga, since you are moving items up a in a structure, while trying to prevent it from falling down. However, Auf der Kippe adds several interesting features by having playing pieces of different weight and a structure that you put them on, that is designed to be movable. It is great fun especially in a party setting or for families with young(ish) children.